The 2013 Vermont Tech Jam will bring innovative companies like SymQuest together for a two-day job fair and showcase of growing Vermont businesses. People searching for tech jobs in Vermont will talk to recruiters, participate in panel discussions, and discover educational opportunities. Presented by Dealer.com and MyWebGrocer, the Tech Jam connects job seekers, students, and those looking to change careers with the tech companies they want to work for. SymQuest-and many of the businesses and organizations represented at the Tech Jam-- are actively hiring dynamic people to fill job openings on our teams. The Seventh Annual Vermont Tech Jam is the perfect opportunity for you to find your new career in the tech industry while viewing the best of Vermont tech companies represented under one roof. Vermont ranks in the top 20 on the State Technology and Science Index, and tech jobs continue to grow as more and more startups make their homes in Vermont. 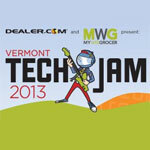 Come see what SymQuest and others are doing to grow the tech industry in the Green Mountains. Speak to a SymQuest representative about how you can start your career with us in an exciting industry that’s always changing.